For some people, wearing ankle weights while walking can enhance the workout. Not only are they getting aerobic exercise, but also integrating a little strength training into their fitness regimen at the same time. The added weight can increase energy expenditure, respiration rate, heart rate and training intensity, which can all have positive impacts on overall health. One of the potential benefits of walking with ankle weights is an increase in your overall endurance. The added weight increases your energy expenditure, which intensifies both respiration rate and heart rate. These two factors have a direct impact on your pulmonary and cardiovascular health. As you improve your pulmonary and cardiovascular fitness, you increase your ability to exert yourself for longer and longer periods of time, and thereby improve your overall endurance. The increase in energy expenditure produced from wearing ankle weight also influences the burning of calories. The more energy you expend, the more calories your body burns at a given time. This can generate what's often referred to as a caloric deficit, which is necessary to promote weight loss, according to the National Institutes of Health. A study published in the "Archives of Physical Medicine and Rehabilitation" suggests that wearing ankle weights during physical activities results in greater weight loss than performing the same activity without them. Like any other weight-bearing activity, ankle weights make your muscles worker harder than normal. Over time, the extra work helps build additional muscle, and thereby strengthens the legs, especially the hamstrings, quadriceps and glutes, according to Dr. Anthony Luke, assistant professor of orthopedics at the University of California San Francisco. However, it's much better to strength train with free weight or weight machines than wear ankle weights. Though the added weight helps build muscle, it also causes strain and stress to your joints, tendons and muscles, which could eventually lead to injury. If you do walk with ankle weights, it's best not to use them every time you hit the trails or treadmill. You want to give your joints, tendons and muscles a break from the added weight. 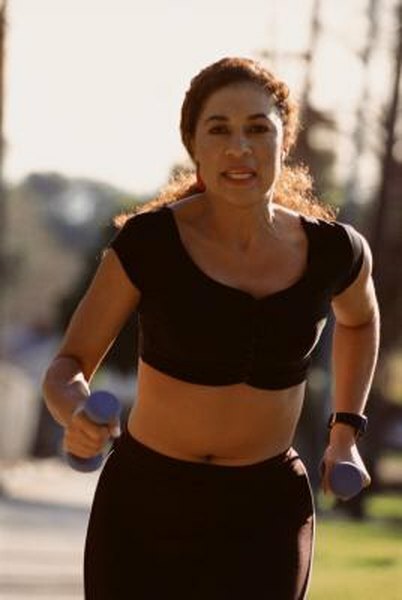 Instead, increase your pace while walking to enhance the intensity of your workout.